Burn down your house. Get drunk on love. Learn to lose. Powerful messages from people with the inner strength to run counter to the world’s ways and connect with themselves. I am drawn to these songs for the power of truth that they contain. Whether mocking, urging, inspiring, revealing or confounding, these songs carry a stamp of authority which comes from a personal experience of truth. It is this same strength, both in the words and in the folk music traditions which carry them, that moves me to become some sort of a vehicle for this poetry and song. Frequently, the Bhaktas and Sufis call us to their land, where there is neither sun nor moon, neither earth nor sky, neither birth nor death. They invite us to experience this ‘shoonya’ within ourselves – a place of no place – which is beyond our narrow boundaries and identities, and which is perhaps the true essence of love. Song teaches us to be in our bodies and listen to our hearts. These poems remind us to encounter our own self. We offer you this album as a gift, in the spirit of service, moved by love to share this beauty and wisdom in the form of songs, along with their words and translation. Big, heartfelt gratitude to all the singers who have always shared their gifts so freely and fully, in the spirit of paying it forward: Shabnam Virmani, Mahesha Ram, Parvathy Baul, Prahlad Tipanya, Mooralala Marwada, Mukhtiar Ali, Mavjibhai Jagariya, Bindhumalini and Vedanth, Bhujodi Bhajan Mandali, and many others in the thriving and vibrant oral traditions of India and Pakistan. And even more, deep gratitude to the poets – Kabir, Shah Latif, Roshik Das, Bulleshah, Meera, Gorakhnath, Sattar Das, Amir Khusro and others – for their generosity in sharing their truths, and to the oral traditions themselves, for keeping these voices alive. Ishq Fakiri is a gift. These songs were received as a gift, and they are being passed on as a gift. 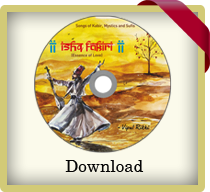 Please explore this site fully to receive these gifts – several songs with their words and translations, spoken introductions to all the songs, discussions, seed questions and more. And once you have done so, don’t forget to pass on this gift to someone else. Pay it forward!